On Sunday, as the Eagles were downing the Jets coming off the bye week, the family and I headed over to Johnson's Farm in Medford to pick out our pumpkins. We, of course, took some photos. It's a virtually required rite of fall for suburban families to trek to some local pseudo-farm with rides and face painting and fresh-baked pies to find the fall decor. We joined approximately all of South Jersey on Sunday in a giant field/parking lot and surveyed the situation with dismay. Two different lines of over an hour before you got to get on the hayride out to where you could actually PICK pumpkins. People EVERYWHERE. Tired children. Swirling dust. We decided to select from the pallets of pre-picked pumpkins available for weenies like me. The children chose $32 worth of pumpkins to decorate the front steps and house with. That's over 46 pounds worth. They enjoyed it immensely. They also loved the side trip to Maggie Moo's on the way back home, though John would have preferred Coldstone. When we finally staggered home, we put up the Halloween lights out front and the various orange and black decorations throughout the house. Yes. I said Halloween lights. It's just amazing to me that Halloween and "harvest" have become such a holiday. 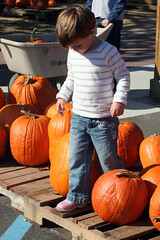 I can remember a few decorations as a kid and a trip to Linvilla for a pumpkin. But I sure don't remember 2 hour lines and swarms of people at Target fighting over who gets the last set of faux tombstones. When did this explosion happen? I've heard the theory that hallmark is responsible for the geometric expansion of the Valentine's Day to the juggernaut of spending it is today? Who is behind the Halloween/Harvest? Pumpkin farmers? Hay bale salesmen? I went along and all ... but I don't get it! I don't know when it happened, but I like it. Fall>All other seasons. Judge Calls Burlco Republicans "Despicable"